Ask Pat: What ball gown styles are good for a hot summer wedding? Dear Pat: I’m getting married in August and am concerned about getting a gown that I won’t sweat through on my big day. I really want a ball gown, but all the ones I’ve tried on so far have tons of layers and feel really heavy and hot. What kind of styles would you recommend for me? Should I give up on finding a ball gown that will work and choose another silhouette? Since our Virginia summers can be so hot and humid, many of our brides pose this same question to us all the time. You absolutely can find a style you love and also be comfortable in on your big day. The key to finding a dress you won’t get too hot in, particularly a ball gown style, is choosing a gown with the right fabric and structure. Here are a couple of examples. Chiffon is wonderfully lightweight and absorbent, and designers are able to drape it very easily, resulting in beautiful skirts like the one pictured on the left. The gown on the right is a well-designed gown made from a single layer of lightweight Thai silk, which holds its shape very nicely. Both would be great choices for a summer wedding. If you prefer an all-over lace look, you can absolutely find a style that will be lightweight enough for summer. Just choose a look with minimal layers, and laces like chantilly, that have a light and airy feel. Have a question you want to ask a real bridal consultant? Email your questions to pat@sealedwithakissbridal.com. Your question might even be featured on the blog! It’s been a couple weeks since our trip to NYC for Fall Bridal Market, and we’ve finally recovered from the whirlwind of a trip it was. We saw and did so much during the trip, and we were impressed by what designers had out on the runway this season. Here are a few of the highlights! Checking out the latest trends. Sheer details have been showing up on the runways more and more, and this season was no exception. Many designers used sheer cut outs and sheer backs in their designs, while others opted to push the limit and showcase designs that were mostly sheer. Left Image: All over sheer design from Muse by Callie Tien; Right Image: Sheer side cut outs on an Anny Lin design. Floral prints have also been on the rise over the last couple years, and we love it! Many brides are embracing colors and prints on their wedding gowns so it’s great to see that designers are answering the call. Seeing a brand new line. 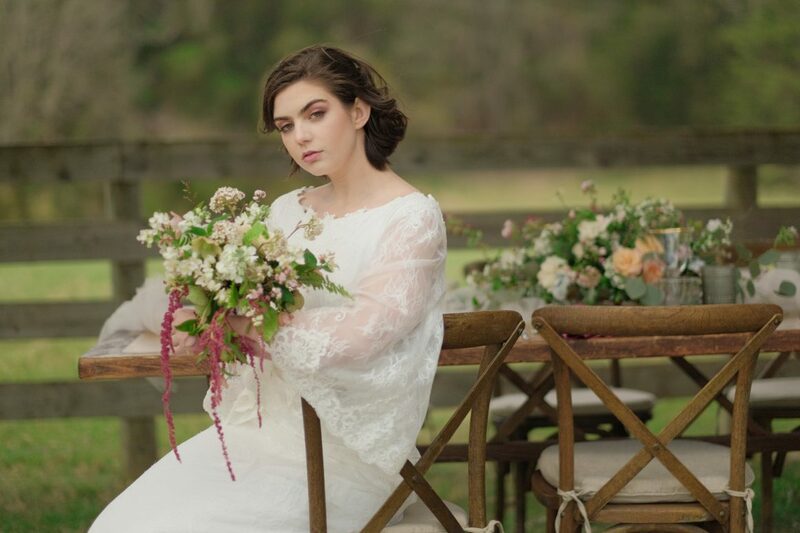 One of our favorite designers, Callie Tien of Modern Trousseau, debuted her new collection–Muse. These gowns were haute couture at its best. We loved the high end fabrics she used in her designs, especially the lace. The silhouettes were dramatic, and brides who want to make a statement with their wedding gown are sure to fall in love with these gowns. Catching up with the designers. While the runway shows are fun to watch, often our favorite part of the market experience is talking to the designers–it gives us a chance to find out how the new collection came about and what they’re working on next. Paula of Paula Varsalona Bridal is always up to something–in addition to designing she teaches at the Fashion Institute of Technology in NYC and regularly blogs for bridalpulse.com. We had a great time hearing about her current endeavors, and we just can’t believe she found the time to create such a gorgeous collection amidst everything else she does. Her new line is a mix of “bohemian bliss” and “city chic,” and every bride is sure to find a gown she loves in the collection. We’re always excited to catch up with Anny Lin, and her new collection did not disappoint! We always expect her gowns to have dramatic silhouettes and gorgeous details, but we were still in awe at how beautiful many of these designs were. Her new line featured gowns with sheer details, prints, 3-D flowers and lots of beads! Overall we had a great time at market, and we are really excited about all the new designs we’ve selected to stock in our boutique. The worst part is having to wait for all our gorgeous new samples to arrive in store, but they are always worth the wait!